Toowoomba Hospice will be holding an event to celebrate the tireless efforts of palliative care workers and volunteers. The National Palliative Care Breakfast will be held on Friday, 25th May during National Palliative Care Week. The week’s theme is ‘What Matters Most?’ which asks Australians to reflect on what would be most important to them if they became seriously unwell. 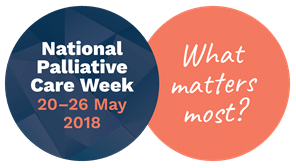 The event, to be held at Gip’s Restaurant in Toowoomba from 6.45 am will celebrate, acknowledge and thank palliative care workers for making a difference in people’s lives. Guest Speaker this year is Marcella Cullen, a Psychologist with the Palliative Outreach Care Team from Toowoomba Hospital. Bookings can be made direct with Gip’s Restaurant 07 4638 3588. The Productivity Commission’s recent report into human services found between 80,000 and 140,000 of the 160,000 people who die each year in Australia could benefit from high-quality end-of-life care. This time of life should be as comfortable and as positive as possible. “Demand for palliative care is increasing. Professionals and volunteers are needed in our community to support patients and carers deal with dying, death and bereavement,” said Mrs Allison Leech -Toowoomba Hospice Director of Nursing. Mrs Leech says that dying is a normal part of life, so it is important for all Australians to have discussions about death and dying and the type of care they would want to receive if they could no longer speak for themselves. “We encourage everyone to discuss their end-of-life wishes with their loved ones and health care team using the Dying to Talk Resources. Knowing what is important to you will reduce their burden at a difficult time and ensure you get the care you desire,” Mrs Leech said.